Embroidered on wholecloth fabric that borders between cream and taupe this rustic cabin style Bear Creek Valance/ Runner features bears wandering among the trees and tall evergreens. 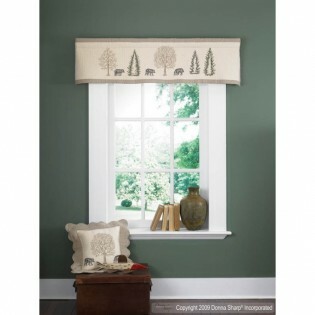 Embroidered on wholecloth fabric that borders between cream and taupe this rustic cabin style Bear Creek Valance/ Runner features bears wandering among the trees and tall evergreens. A perfect hint of the woods for your room this valance/table runner measures 15"X60".